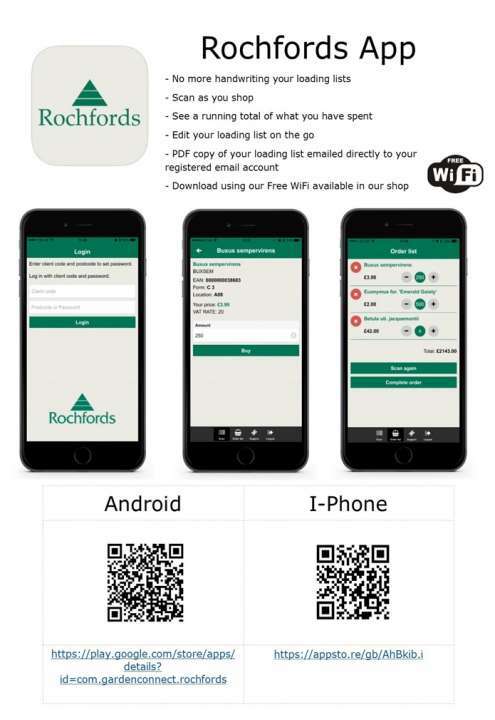 We introduced the Rochfords app to improve our cash and carry process back in October 2017 and it has been a great success, with over 12,500 orders processed through the app in this time. This helps us to reduce the heavy paper trail, keep a better record of stock on our database and record sales more accurately. It also allows you to keep on top of your purchasing as we email a copy to you on reciept of each transaction. We have a database of previous orders alongside this, meaning you will always have access to the list of plants you purchased. With this continued success, we have decided to go fully paperless and will only use the app for cash and carry transactions. We will still offer our in-house scanners but it would be preferred if you could download the app onto your own smartphone as we only have a limited number of scanners available. You can do this by visiting the app store, Google play store or other operating systems based on your device. Your login details are available from the shop. The initial login for the app does require a strong data/ wifi connection and because we are located rurally the phone signal on site is quite poor, this may cause the app to fail on the login/sync process. We recommend heading to the shop upon arrival to use our wifi to make sure you login correctly, and of course if there are any other issues then we can assist with that too. If you have any further questions, or would like a full demo then please get in touch. Developing the app and going paperless has been quite a big step for us. Thank you for choosing Rochfords and moving with us into the future of buying.